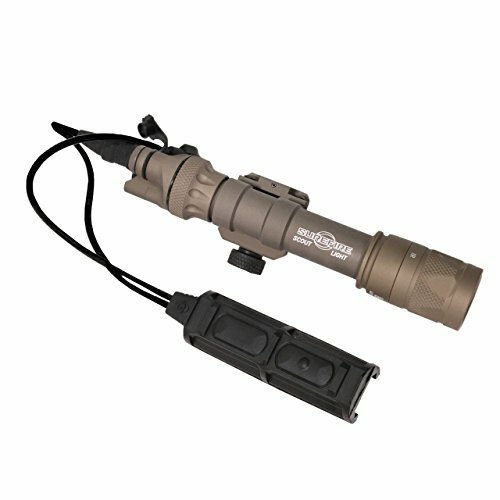 The compact M603V Scout gentle produces 350 lumens of brilliant white gentle or 120 milliwatt of invisible Infrared output to be used with night vision devices – without having for IR filters or spare lamps; attaches to Picatinny rail with a Thumbscrew. To change between white gentle, disable, and Infrared modes you merely pull then twist the front knurled section of the bezel. In either mode, the m603v’s TIR lens produces a decent beam suited to short- to medium-vary applications. The Top-potency LEDs are Nearly resistant to failure since there is no filament to burn out or break. Comes with a momentary/constant-on pushbutton tail cap switch. The M603V clamps solidly to any long gun supplied with a Picatinny rail by means of its integral Thumbscrew rail clamp. Constructed of Top-strength aerospace aluminum with mil-spec exhausting Anodizing for superior toughness and corrosion resistance, and optically coated Tempered glass for sturdiness and most gentle transmission, the M603V is o-ring sealed to stay out dust, dirt, and moisture. Battle-proven and built to resist the trials of combat. The sr07-d-it supplies remote momentary-on activation, either one after the other or concurrently, for 2 weapon-mounted illumination tools – a SureFire weapon gentle and an Insight ATPIAL laser illuminator/pointer. Separate plug-in cables connect every device to the switch platform, where two pressure-pad switches are integrated with a single Snap-On clamp for simple attachment on your firearm’s Picatinny rail for end.